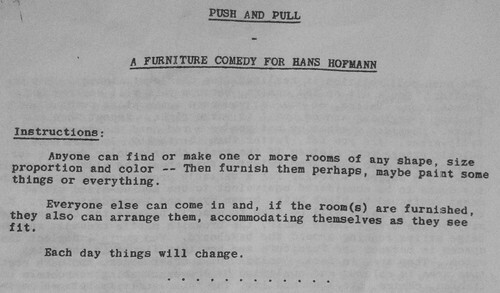 Creative Time organised a presentation of Allan Kaprow’s Push and Pull: A Furniture Comedy for Hans Hofmann, during the Performa Festival. It ran for three days at a space called Passerby. Push and Pull is a dynamic installation in which anyone can come and rearrange furniture which is spread around in a room. Well, we might call it an installation now, but in Kaprow’s day (the piece was first presented in 1963) it was a “Happening” (or an “Environment”). It’s clear that Kaprow, in the four years since 18 Happenings in 6 Parts was presented, had substantially reworked his idea of what a Happening should be. If 18 Happenings in 6 Parts was a sort of experimental theatre involving specially prepared “actors”, then by the time he devised Push and Pull, Kaprow had moved on to creating situations where the “audience” was now the primary activator of the work. 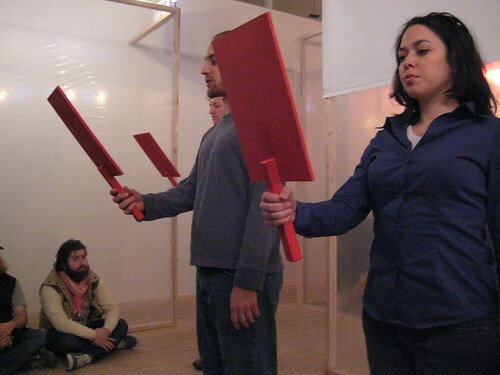 This entry was posted in performance art, re-enactment and tagged allan kaprow, boundaries, conceptual art, environment, happenings, instructions, performa, performance art, push and pull, re-enactment, rules on November 23, 2007 by Lucas. On Sunday night Lizzie and I went down to Long Island City to see the “re-do” of Allan Kaprow’s 18 Happenings in 6 Parts. I’m a big fan of Kaprow’s work and his writings, and I’m also really interested in re-enactment or re-creation as a method of experiencing ephemeral artwork from the past. (Karinne Keithly has written another account of 18 Happenings over here). This entry was posted in performance art, re-enactment and tagged allan kaprow, conceptual art, happenings, performa, performance art, re-enactment on November 13, 2007 by Lucas. -THOSE INTERESTED IN PARTICIPATING SHOULD ATTEND A PRELIMINARY MEETING AT THE PASADENA ART MUSEUM, 46 NORTH LOS ROBLES AVENUE, PASADENA, AT 8.30PM, OCTOBER 11 10, 1967. THE HAPPENING WILL BE THOROUGHLY DISCUSSED BY ALLAN KAPROW AND ALL DETAILS WORKED OUT. 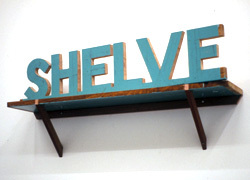 This entry was posted in performance art and tagged allan kaprow, fluids, happenings, instructions, performance art, score, script on January 12, 2006 by Lucas. SOME UNUSED HOUSES IN DIFFERENT PARTS OF THE CITY. ON EACH OF 4 DAYS, OLD FURNITURE IS OBTAINED AND IS PUSHED THROUGH THE STREETS TO THE HOUSES. THE FURNITURE IS INSTALLED. ON THE FIRST DAY, BEDROOMS ARE FURNISHED, AND SLEPT IN THAT NIGHT. ON THE SECOND DAY, DINING ROOMS ARE FURNISHED, AND A MEAL IS EATEN. ON THE THIRD DAY, LIVING ROOMS ARE FURNISHED, AND GUESTS ARE INVITED TO COCKTAILS. ON THE FOURTH DAY, ATTICS ARE FILLED AND THEIR DOORS ARE LOCKED. THOSE INTERESTED IN PARTICIPATING SHOULD MEET AT 8PM NOV 27 1967 AT THE MUSEUM OF CONTEMPORARY ART, CHICAGO. -from poster displayed in Warhol's Time Capsule show at the NGV. This entry was posted in performance art and tagged , allan kaprow, happenings, instructions, score on April 1, 2005 by Lucas.